Contents Includes 1 sign holder comprised of 2 black sign uprights (one with wheels), 3 black cross tubes, and 1 set of assembly hardware.The STANDARD version comes with two - 24" x 36" x 4mm white sign faces with 7 letter tracks on one side of each and one set of 314 - 4" letters, numbers and symbols (black letters & red numbers). 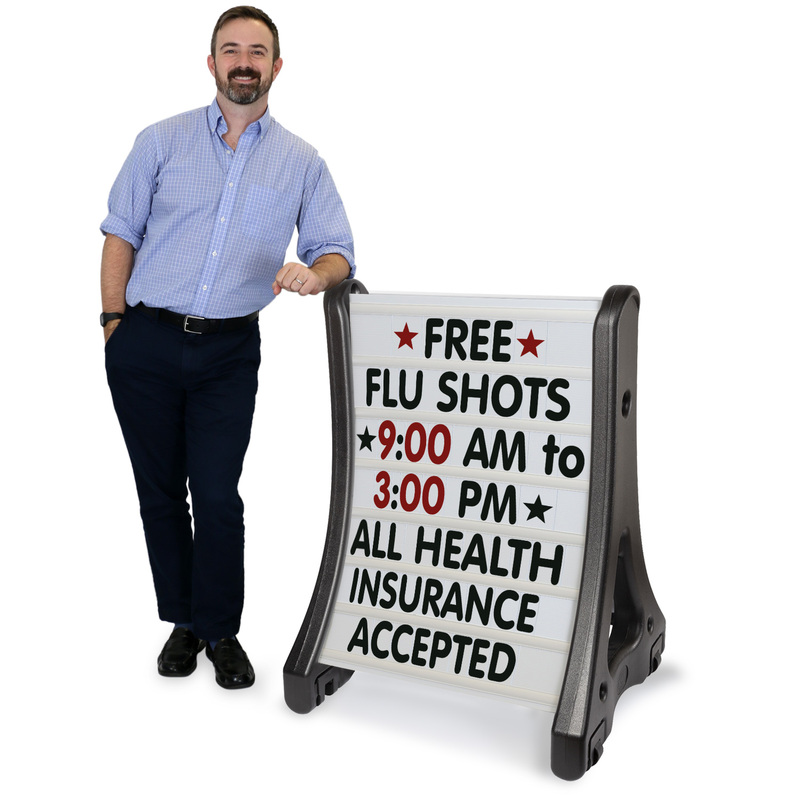 Customize your own message easily with a Quick-Loading A- Frame Sidewalk/Curb Sign. • Curved sign face deflects winds of up to 30+ mph. For added stability in windy conditions fill the ballast port with water or sand. • Recessed wheels sit above ground level and engage when the sign is tipped to make moving a breeze. When in use, the sign rests on four rubber feet. • QLA™ A-Frame Sidewalk Sign Holders are made from rustproof plastic technopolymers to withstand harsh environments. Whether its snow, rain, sleet, or the baking heat of summer these practical holders won't fracture, break or degrade. • The A-Frame legs feature curved channels that are designed to fit any 24" (w) x 36" - 48" (h) material with a thickness of 4mm (3/16"). This contour allows any inserted sign component to deflect winds of up to 30+ mph. • Converts 29” x 42” QLA™ A-Frame Sign Holder into a 2-sided Message Board sign that displays 7 lines of copy. • Alcoved 2.5" diameter wheels are suspended above the ground and can be deployed by simply tipping the frame – providing easy transport or maneuverability. 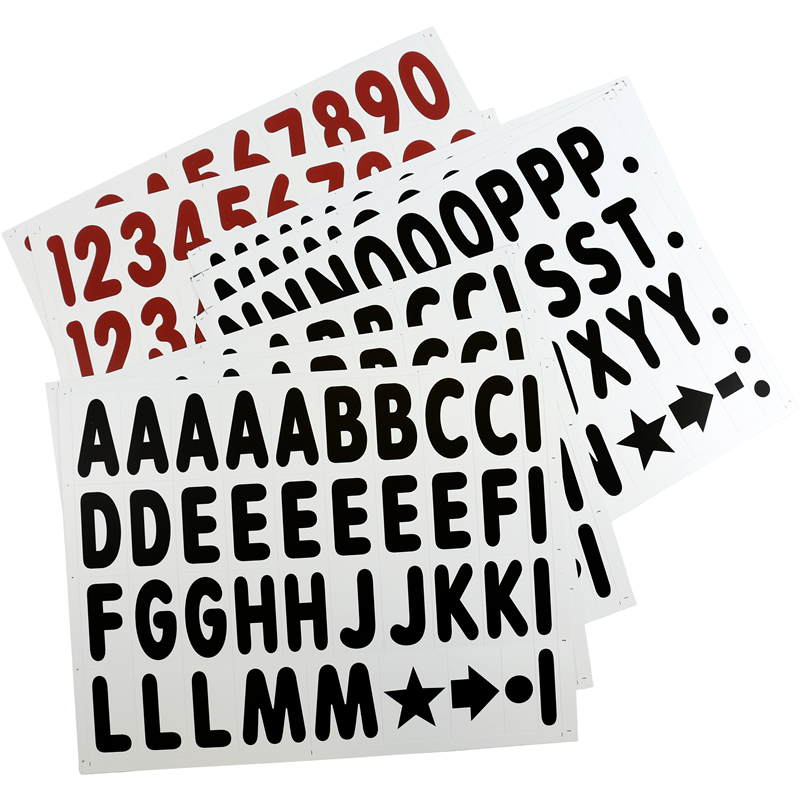 • The STANDARD version comes with two - 24" x 36" x 3/16" (600 x 900 x 4mm) message boards (black or white) with 7 letter tracks on both sides and one set of 314 - 4" letters, numbers, and symbols (black letters & red numbers or white letters & red/white numbers). 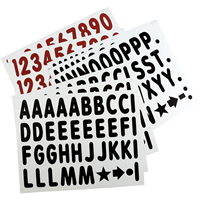 • The DELUXE version comes with two - 24" x 36" x 3/16" (600 x 900 x 4mm) message boards (white or black) with 7 letter tracks on both sides, one set of 314 - 4" letters, numbers, and symbols (black letters & red numbers or white letters & red/white numbers), two - 9" double-sided headers (Sale/Special in red or red/white), and one set of 22 - jumbo 8" numbers with the percent symbol with the percent symbol (red or red/white). The sign was perfect and added a profession touch to the outside of our store! Easy to assemble and letters are easy to place on the sign. It is very windy here today and sign is near the street. I purchased two bags of sand to secure it. I am satisfied with the purchase. I'm doing a meteorite display at our local public library in conjunction with the upcoming solar eclipse, and the sign will help advertise it as patrons approach the library. Thank you for the quick shipment. Sincerely, Steven.